Arthur Adams Marvel Fanfare #37 Spider-Man, Black Cat, and Hobgoblin Pin-Up Page Original Art (Marvel, 1988). An incredibly evocative piece of artwork showcasing Spidey, Felicia Hardy, and the Hobgoblin, this piece was actually drawn four years earlier (in 1984) than when it saw print. A prime-period piece by a top talent, and the sensitivity of the intricate linework is stunning. 'Nuff Said. 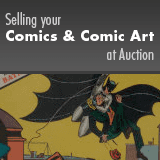 This Marvel masterwork has an image area of 10" x 15", and it is in Excellent condition. Signed and dated twice.